There are a lot of techies and gadget people out there. 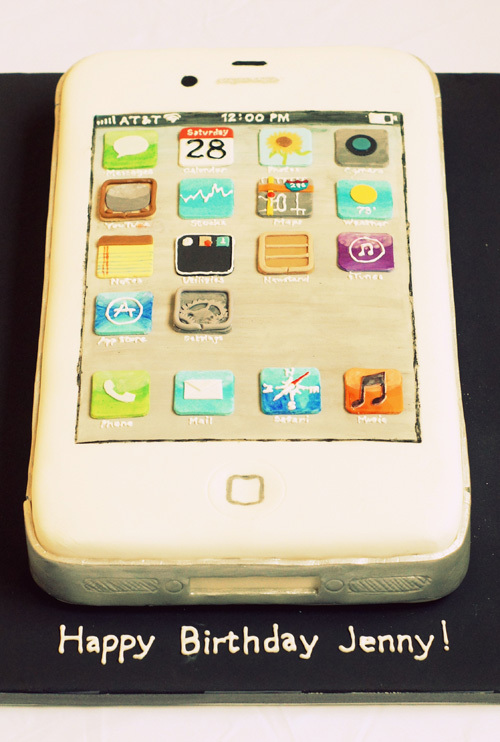 An iphone cake would really hit the funny bone of any tech lover or just a plain phone freak. That is exactly what this client did for her friend. We went with the latest version (at that time) of the iphone 4 model in white. Each detail from the background to each app icon was painted and crafted by hand (the google maps app was a task in itself!). Other ideas for these custom celebration cakes would be to make mini cakes, cupcakes or cookies with the app icons on them. For the most simplistic setting, you can get a white cake with an Apple logo or any tech logo of your choice. Ipods/mp3 players and laptops are also popular choices. Why not make it twice as interesting or triple and have two or three sculpted cakes for one jaw-dropping ensemble? Maybe your honoree is more of a social media person. We could create a Facebook or Twitter themed cake for you! Other cakes that deal with personal interest are the Steely Dan “Aja” cake, the Air Jordan Jumpman cake, and the Red Sox Baseball Cap Grooms cake.